Kamera Betrug: 4 (vier) Samsung Galaxy S2 für 1.000 Euro. 4 (vier) Samsung Galaxy S2 für 1.000 Euro. 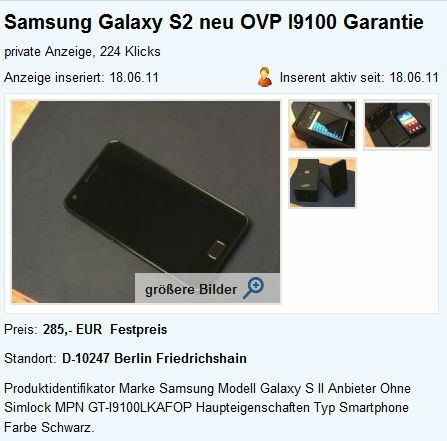 Mal wieder klingt es überaus verlockend – aber beim Angebot gleich 4 Samsung Galaxy SII für einen Preis von 1.000 EUR zubekommen sollten schnell die Alarmglocken angehen. Der Preis dieses neuen Handymodells liegt nämlich bei ca. 500 EUR. Und mal wieder sitzt der vermeintliche Verkäufer in Spanien. Die Masche klingt soweit bekannt. Interessant an diesem Fall ist, dass die E-Mail-Adresse nach Sri Lanka führt. Auf der Seite des „Department of Marketing Management” wird die Adresse zur Kontaktaufnahme angegeben. All dies wirkt nicht sonderlich vertrauenswürdig – daher sollte man auch nicht dieses verlockende Geschäft eingehen. Telefon ist neu, Original, ohne Sim-Lock mit rechnung, Garantie und allem Zubehör. 1 Stück ist 300 EUR. für mehr Stücke Ich kann einen niedrigeren Preis. willst du mehr Stücke ? E-Mail direkt hier: dmmkt@hotmail.com oder schreiben mir Ihre E-Mail Adresse. The phone is new, unlocked ( you can use it on any network ), original and it comes with all accessories. It has 1 year internation warranty. Just need a SIM-card and will work perfect. I am in Spain, the package will be sent from here. Tel No: 0034 672 542 860 . The price includes all shipping costs to your home address. I will send you the package with a shipping company directly to your home address. in collaboration with Google Checkout. The package is inspected at the company, because it is insured. Payment method through Google Checkout is wire transfer by bank account. You don't need to register by Google Checkout and you should know that you will check the package before I receive the money. You will test it for 7 days. Respond if you are interested to explain the process! Please read all the steps with attention so you can understand it. First I will go with the package to the shipping company ( wich is in collaboration with Google Checkout) and they will inspect it ( because the package is insured ) and start shipping ( I will pay all costs ). After this I will have to contact Google Checkout and provide them all the necessary information ( shipping details ), so they can start the process right away. I will be needing your full name and address and phone number for that. You will receive a notification from Google Checkout together with all the instructions to follow and the instructions as well, after I made shipping. Regarding the payment, you will be instructed to deposit the money to Google Checkout. They will hold and insure your money until receipt of the item in good condition. That is how their buyer protection policy is working. As far as the seller concerns, i will be glad to know that Google Checkout has the possession of the money during the delivery period. That is my insurance. The item will be delivered to your address in no more than 7-8 working days. You will be given a 7 days inspection period from the day you receive the item at home. If you decide to hold the item, then you will have to authorize Google Checkout to release the funds to me, and the transaction will be completed. If you will not be satisfied with the item, you will be able to send the item back through the same shipping company, and ask Google Checkout to return the funds to you. If you wish to proceed with the purchase, please provide me your full name and address and phone number so I can start shipping of the package and then the Google Checkout process. Google Checkout will hold the shipping because they act as a neutral third party ( will be authorised by me to put the package on stand by if you don't agree to complete the instructions) and Google Checkout will hold the money too. A short explanation of this process: First I will go to the shipping company and start shipping, after this I confirm shipping details to Google Checkout ( with tracking number and everything ). then Google Checkout send you instructions for payment and after you complete the instructions to one of their agents you receive the package in 7-8 days. after you receive the package and test it for 7 days you confirm to Google Checkout if they can release the funds to me. Payment is made by bank account to Google Checkout. If you are interested send me your full name, full address and phone number to start shipping and then the Google process! Waiting for your answer regarding the transaction!